It often seems like your bills never stop coming and some months you wonder how you’ll pay them. If you’re worried about covering your debts, how will you find the money to put away for a rainy day? Since emergencies happen whether you can afford them or not, with the help of ZenHabits.net, we have a few simple ideas for you to create an emergency fund. It doesn’t have to be a large amount, but by saving with every paycheck, say $25, you can get started on padding your emergency fund. Treat it like a bill and automatically put that money in your savings account. Gradually increase this amount when you can, and you’ll be well on your way to having some in-case-of-emergency money. Find something you spend money on every week that you don’t necessarily need and eliminate it. Whether it’s a trip to Starbucks every day or a magazine subscription, take the amount of money you spend on it and put it in the bank instead. Instead of using your year-end bonus, tax refund or other cash windfall on frivolous things, put that money directly into a savings account. You’ll be happy it’s there when you need new brakes on your car or if your roof starts leaking. 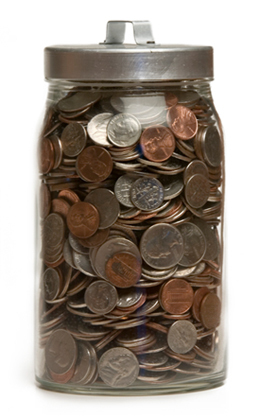 The next time you make a purchase, take the quarters, nickels and pennies you receive in change and throw them in a jar. Once they all add up to a tidy sum, cash it in and put it in your savings account. Another way to help with this is to round up when you balance your check book. If you make a purchase with a check or your debit card for say $20.75, subtract $21.00 from your balance and put the difference in your savings account. Some banks automatically do this for you, but if yours doesn’t, keep track of it yourself and transfer that money into your savings once a month. Once you’ve paid off your car or credit card balance, since you already budget for it, take that monthly payment and put it in your emergency fund every month. Set a minimum amount you want to keep in your fund and use the excess to pay off a debt. If your set amount is $500 and you owe $500 on a credit card, once you reach $1000, pay off your credit card and you’ll still have a $500 padding in your account. These are just a few ways you can find extra money to help you get started on your emergency fund. Once you start finding creative ways to put money away, you’ll be able to pad your account in no time.